The Kaiu family are without question the best engineers in Rokugan. They are the architects of the Carpenter Wall, as well as the catacombs and traps beneath. If anyone in the empire wants to build a structure that will rival all others and stand throughout time, they consult a Kaiu. Those who deal with the Kaiu are often surprised by how quiet and soft spoken they are, displaying none of the usual "Crab temper". They are reserved, calm, and act with a foresight that Shinsei himself would envy. They are builders, planners, engineers, and refined architects, calm, cool, and under control who produce the most potent weapons and ingenious defenses in the Empire. The Kaiu think of themselves as the rock anchoring the Hida and Hiruma families. The Crab Clan's support and defenses would be paralyzed without them, so they have little time to search for glory for themselves. Their philosophy emphasizes the larger picture and the long term benefits of their actions. They love to plan and enjoy seeing intricacies of a well-laid scheme coming together. The Kaiu Mon represents the sturdiness of the Kaiu and their position as the foundation of the Crab Clan. 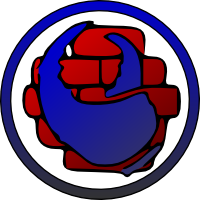 The bricks represent protectiveness or a shield against danger, and the claw represents hidden weapons striking if the defense is breached. A Kaiu giving something built with his or her own hands has made a serious gesture of respect and friendship. Many Kaiu have the curious habit of chewing tea leaves, no doubt because of the prevalent tea harvest in some of their provinces. The family's home is Kaiu Shiro, which is literally inside the Kaiu Wall. The wall was built around the fortress, and the Kaiu care for both with equal fervor. Their lands are comprised mostly of the Twilight Mountains, so some engineering knowledge is practically bred into the people of the area, as a major portion of their income comes from iron mining. Much of the rest comes from the growing and harvesting of tea. The Kaiu Wall, also known as the Carpenter Wall or the Kaiu Miracle, for centuries was the very physical demarcation of the southern border of Rokugan. On its north side lie the lands of the Crab Clan, and on its south the blighted reaches of the Shadowlands. It was here that the forces of Rokugan entrenched themselves in their eternal battle against the forces of darkness. The Carpenter Wall was over 100 feet tall with its foundations sinking many 100's of feet beneath the soil. Its battlements were almost 30 feet thick and it was garisoned by 150,000 samurai and stocked with enough rations to feed an entire army for two years. It has strongpoints located at 50 yard intervals, which housed siege engines. Each blockhouse holds one crew for the engine and a further two units of troops numbering 50-100 bushi. Between the strongpoints archers and bushi patrolled. There were also 12 great towers that lined the wall from end to end.